The Ministry of Defence has announced plans to spend £127m to design a new warship for the Royal Navy. 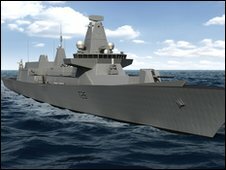 The four-year contract to develop a design for a new frigate, the Type 26, has been awarded to BAE Systems. BAE was also given the go-ahead to start building the latest Astute Class nuclear submarine in Barrow-in-Furness. The Unite union welcomed the latest defence deals. It says they will secure around 10,000 skilled manufacturing jobs in the UK. Babcock International has also signed a new agreement with the MOD. The 15-year partnering deal, worth around £1.2bn, is for the provision of submarine support and maintenance services at Royal Navy bases at Devonport in the south-west of England and on Clydeside, Scotland. Unite's national officer, Bernie Hamilton, said the three deals would safeguard thousands of jobs across the country. "Workers at Barrow, Devenport, Rosyth, Scotstoun, Govan and Faslane have work for years to come thanks to the government," he said. The government says the new vessels will help to give the navy "cutting edge capabilities" while safeguarding the UK defence industry. The Ministry of Defence (MOD) has confirmed the contract in spite of the £700m worth of efficiency savings it has promised to make as part of the government's overall spending cuts. The Type 26 will be a frigate, like the Types 22 and 23 it will replace. But the Ministry of Defence refers to it as a "combat ship" because it will be expected to be more flexible than its predecessors. The First Sea Lord Sir Mark Stanhope said it would form "the future backbone" of the navy. In addition to being used in anti-submarine warfare, the Type 26 will be expected to provide support for land operations, carry out surveillance, intelligence, counter-terrorism and piracy operations and help with disaster relief and humanitarian aid projects. An 80-strong joint BAE and MOD team is already working on the project in Bristol. Its numbers are expected to be boosted to 300 over the next four years. Defence Secretary Bob Ainsworth said he had also agreed for BAE to start building the fifth of a planned seven Astute Class submarines in Barrow-in-Furness in the north-west of England, and begin procurement for the sixth. The contract is worth £300m to BAE. Mr Ainsworth said programmes like the Type 26 and Astute "not only ensure the Royal Navy continues to have cutting edge capability but also sustain the industry that supports them". The Astute Class are "next generation" nuclear-powered submarines, described by the MOD as "the biggest and most advanced attack submarines ever ordered for the Royal Navy". BAE's website, which describes the Astute as an "underwater hunter-killer", says it will undertake a range of tasks including intelligence gathering, Special Forces and anti-submarine warfare. The company says Astute has greater weapons and operations capabilities and improved communications facilities compared to existing submarines. Armed with Tomahawk cruise missiles, BAE says it has a strike range of up to 2,000km. John Hudson, Managing Director of BAE Systems, Submarine Solutions, said the deal would allow BAE Systems to continue to recruit highly-skilled engineers to meet the workload. "Just as importantly, it will help sustain key skills and capabilities throughout our workforce, our suppliers and partners," he said.